Salt is actually very good for your body, but too much of it can be troublesome for your health and energy levels. Conversely, too little salt in your body can also have some serious consequences. The key here is balance. You want a solid balance of salt in your body for maximum efficiency. Salt is otherwise known as electrolytes, and they’re what your cells use to hold fluids and actually keep you more hydrated. In addition, these electrolytes provide you with massive reserves of energy to use. When you’re trying to lower the amount of salt you have in your blood, you need to make sure what you’re eating doesn’t contain a lot of sodium. More often than not, it can be hard to notice a lot of salt on your foods, because it often blends quite well with the flavors of food. This is most evident in fast-food. Fast-food tastes great, and the main reason why it does is because of the extremely high sodium content. The fries are loaded with salt, the burgers are soaked in it, and even a lot of the chicken contains high amounts of salt. Oh, and don’t forget the chicken nuggets! A lot of Americans, this is their main source of nutrients, and is a lot of their meals each week, especially when they work office jobs. 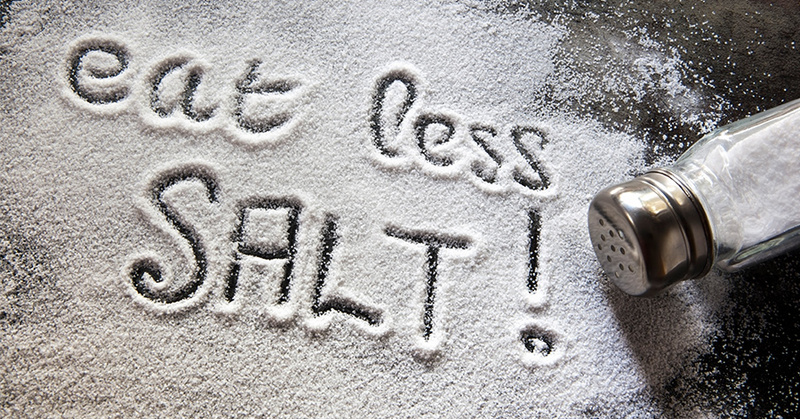 If your salt levels are elevated, it is definitely a really good idea to increase the amount of water in your body. With extra water in your body, you’ll be able to counter the extra salt that your body contains. So really, as long as you’re drinking at least 60 ounces of water per day, you may keep your salt levels a little higher than normal, but it’s still recommended to lower them. This is the maximum amount of salt that the FDA recommends in the average adult’s diet. Most Americans have diets that contain 7 teaspoons of sugar or more. This is out of control, and it’s the reason why we’re seeing such an influx of heart disease and stroke. As long as you’re eating whole foods, vegetables, fruit, and perhaps nuts, you’ll be golden when it comes to your salt levels. Stay healthy!